Thinking on your feet, staying calm under pressure and applying months of training and practice. 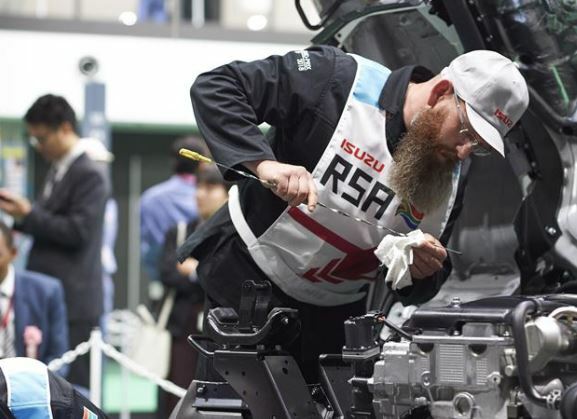 This was what Isuzu truck technician Miles Swanepoel had to do, to beat 64 other technicians from across the world in the recent Isuzu World Technical Competition in Japan. Swanepoel ended in fourth place overall in the individual I-1 Grand Prix's Commercial Vehicle division of the competition. The top three positions were taken up by technicians from Japan (first), Indonesia (second) and Australia (third). The competition, which was hosted over two days, consisted of individual and team divisions with representatives from 32 participating countries. The technician from Isuzu Truck Centre Cape Town, said even though he was hoping for a good position in the individual competition, he wasn't sure where he would end up since the level of the competition was very high and every year it is raised to a higher level. "As a team, we had to work on a power steering box and individually we had to solve problems on a stationary truck, each one with the same fault. In the individual competition it was required of us to carry out the 50-point inspection to identify six faults on the truck, a complete vehicle inspection. We had three minutes to strategise individually without our coach and 17 minutes to apply the practical work individually," said Swanepoel. Swanepoel, who has 17 years' experience in the industry, has spent the last 10 years at Isuzu Truck Centre in Cape Town where he also started his career as an apprentice in 2000. He said he would recommend the competition to all Isuzu technicians because of the four months intensive training and preparation work ahead of the competition. "It helped me to gain valuable information that I use in my daily work. You learn so much and challenge yourself. Even though I have worked on other trucks that belong to our customers, I prefer the tough Isuzu models - I maintain it is the best truck option on the market," said Swanepoel. He was also part of the Isuzu team that ended in sixth place overall in the same competition. "The level of expertise gets higher and higher every year. Particularly the theoretical test was very challenging - you need to know everything about the vehicles - from bumper to bumper. The judges were very procedure-orientated and want you to follow the manual step-by-step."